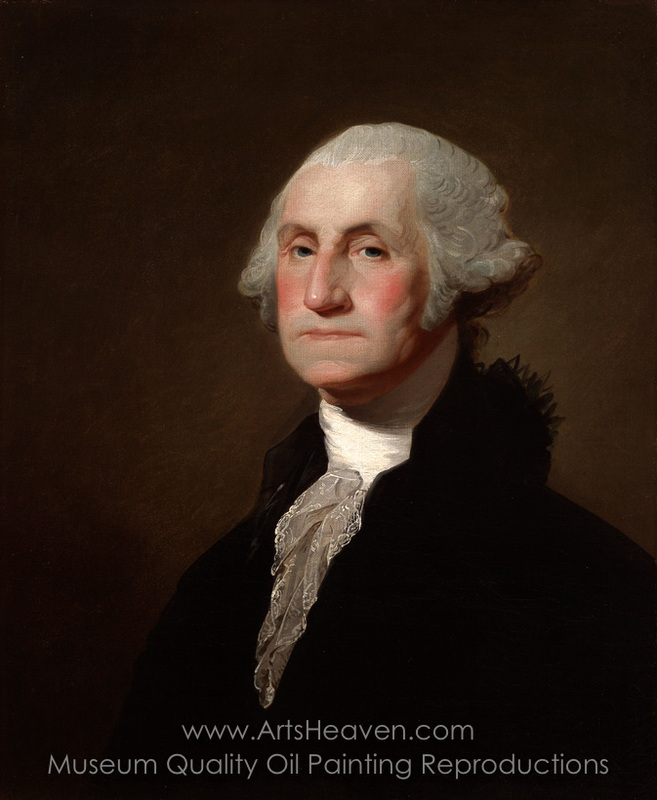 Gilbert Stuart's 1797 portrait George Washington is a stunning reproduction of the likeness of the archetypal American hero and founding father of the nation. Having painted three different portraits of Washington before his death, Stuart's renderings of the President are forever tied to the individual. So ubiquitous are they that is seems almost impossible for Americans to imagine George Washington in any other way. In 1795, Gilbert Stuart completed the first of three portraits of the president to immediate acclaim, causing Washington to commission another soon after. This version is a visual articulation of Washington's role as both leader and father founder of his country, and is arguably the most accomplished of Stuart's works. 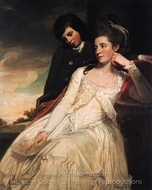 Began in 1796 for William Petty, the first Marquis of Lansdowne, a British admirer of George Washington, the canvas was completed in the grand style in fashion throughout Europe for painting members of the nobility. Almost certainly fulfilling the wishes of his British patron, Stuart depicts the President standing in the classic pose of a speaker in front of a background of draperies and columns, with a passing glimpse of a distant landscape in the background. Stuart's details, however, are clearly American. Washington wears the black velvet suit he used for formal occasions, and set on the table are the volumes of the Journal of Congress which refer to the foundation of the government and the role of George Washington as the head of the state. The medallion that bears the Stars and Stripes on the back of the chair is part of the Great Seal of the United States. 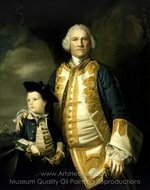 Indeed, when the portrait was exhibited in New York City two years later, an advertisement stated that Stuart had painted George Washington surrounded by allegorical elements of his public life in the service of his country, further illustrating the tremendous strength and endurance that he faced enacting his duty. Stuart's forceful yet paternal and serene vision of Washington is a vision of the man after weathering the storm. The purse-lipped smile denotes satisfaction and inner peace at the completion of his life s work. A number of contemporary accounts describe the lengths the artist had to go to persuade Washington to let his guard down for the portrait and reveal the depths of his personality behind his public persona. Using his conversational talents, Stuart achieved a personable and friendly representation of the figure which delights Americans to this day. 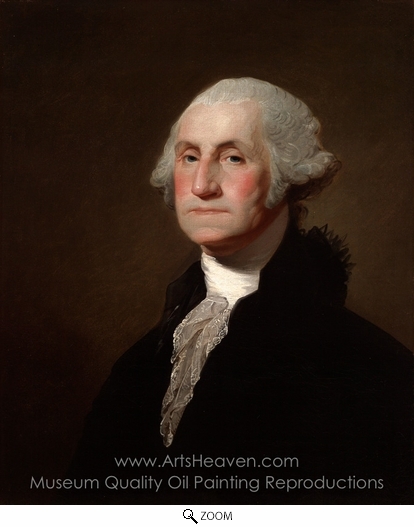 Decorate your home or office with our beautiful museum quality art reproduction of Gilbert Stuart George Washington painting. Why settle for a print, poster, giclee or canvas transfer when you can grace your walls with a genuine oil on canvas painting reproductions for sale at up to 75% below gallery prices. You are commissioning an authentic hand-painted oil painting on quality artists canvas. Painted by professional artists brushstroke-by-brushstroke with attention to all details. Order your Masterpiece today and get Free Shipping to your door direct from our studio.